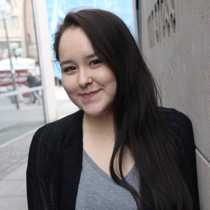 Caroline Nochasak of Nain spent her summer connecting with her Labrador Moravian past - one song at a time. The 18-year-old was tasked scanning, describing and organizing hundreds of pages of music manuscripts that were first introduced to Labrador 150 to 200 years ago by German missionaries. At the hands – and through the voices of Inuit musicians, this music became an important part of Labrador Inuit cultural heritage. Working with the Tradition & Transition Research Partnership under funding from Inuit Pathways, Nochasak uncovered hints of the musical life of her ancestors from the dusty pages she was documenting. Nochasak was the first to hear some of this music aloud in over 100 years. The collection comes from the Okak mission station, closed aver the devastating outbreak of the Spanish influenza in 1918. For almost 100 years, these manuscripts were boxed up in an attic in Nain. Between the margins of the handwritten pages were notes and clues to the past says Nochasak. Each detail hidden among the pages helped her piece together a little bit of the Labrador Moravian story. Nochasak, like her grandfather and great grandfather play the violin. She says that musical culture has always been an important part of the Labrador Inuit way of life. Music is something she grew up with as many people in her family play in the Nain brass band, sing, or play instruments. She says while it was the German missionaries that brought this music to the Labrador Inuit, there was already a strong musical tradition alive and well. Now that the manuscripts are scanned, Nochasak says that she hopes they will stay in Nunatsiavut for a long time to come. She hopes that by digitizing the documents more people in Nunatsiavut - and beyond - will be able to access this important part of Labrador Inuit history.